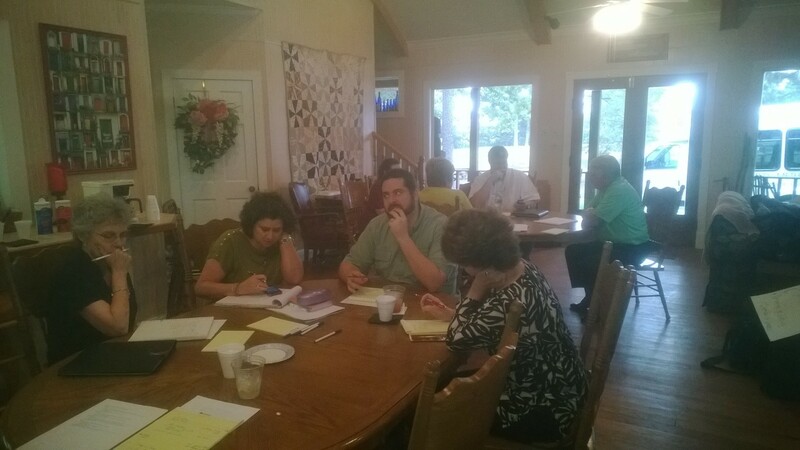 I “planned” for our staff at FUMC, Monroe to go on a planning retreat yesterday. We did. The Holy Spirit, however, decided to throw me a curveball. Oh, we went on the retreat, but the Holy Spirit started pitching very early in the morning. I think I struck out on one pitch. The rest of my morning was off balance. I knew that we should go away from the office, away from the phone calls, away from the distractions, and reflect on ministry. Isn’t that what church staffs are supposed to do? Yet, I heard the Holy Spirit saying very early in the morning that we can rely too much on our own plans, as if our planning is what makes all the difference. I had “planned” a very specific course of action for the day away. I had an idea of what I wanted to accomplish in our time together. I really wanted to come away from the time with a “plan” for ministry for the year 2014. What would be a theme? What would be some ideas for sermon series? What studies would we plan? That was the “plan.” But, God had other plans. The day became a day of reflection for us. We brainstormed. We talked. We named our strengths. We named our weaknesses. We identified some potential opportunities. We acknowledged some threats. We ate. We laughed. And, at the end of the day, we had one idea. One idea. All day away, and we came up with one idea. It’s not what I was planning to accomplish, but maybe it was all we needed to accomplish. Maybe that’s the one idea God wanted us to discover yesterday. It’s not helpful that I still have sermon planning and study planning to do, but at least we have one idea (no, I’m not going to tell you what the idea is–our staff knows, we’ll roll it out soon enough) as we move into the new year. My plans are just that–my plans. I’m quite sure the man in Luke 12 wasn’t planning on dying when he decided to tear down his barns and build bigger ones. That’s what we do way too often. We make our plans and then ask God to bless them. All the while God’s got other plans. I wonder if that’s why too many congregations struggle. Rather than looking for what God is doing and going to join Him in doing it, we decide what we want to do, and then ask God to come go along with us, and we sure would appreciate His blessing along the way. But, whether He chooses to bless it or not, we’re often so obstinate that we continue to do it anyway. So many congregations plan the same ministries year in and year out. If we just work a little harder this year. If we just do a better job of communicating to the congregation and community. If we could just get people more committed. If we had more workers. If, if, if…and we never realize, it’s not the lack of hard work (the church has plenty of hard workers), it’s not the lack of communication (okay, sometimes it is), it’s not a lack of commitment. Our failure comes in refusing to listen to the Holy Spirit. Our failure comes in taking our plans and laying them out and failing to hear where God is actually leading us. Perhaps we don’t hear because we don’t even ask. Planning, for those is congregational leadership, is indispensable, even if the plans end up being totally useless. It’s all in God’s hands anyway. I think that your experience was to be together as a team and learn more about each other in order to facilitate better interaction in the future. Ideas will come and go, setting up a good path to communication of ideas is so much more important. Success is how I would describe yesterday. You are correct, Richard. Thanks for reading!